Oh my! I LOVE this range! 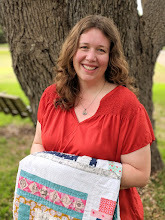 I am so glad that you blog about fabric that you love - I don't think I'd know about many of the beautiful ranges otherwise. I really enjoy Rita's blog too. 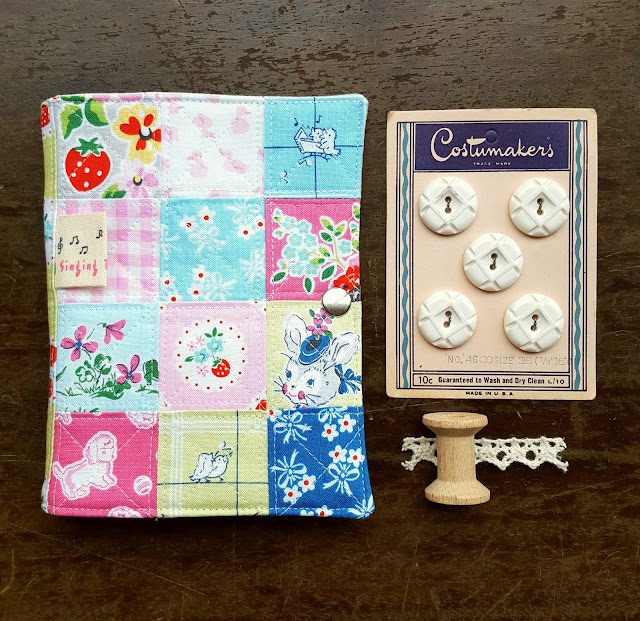 Actually, I popped over to Minki's and have earmarked my lace zippers (which I bought ages ago but haven't known how to use them) for a box zipper pouch. This is so pretty - it really showcases the fabric. Your girls must love it! Beautiful! And brilliant idea on the use of the cheater print! I don't use cheater prints, but I would to do a "scrappy" binding. 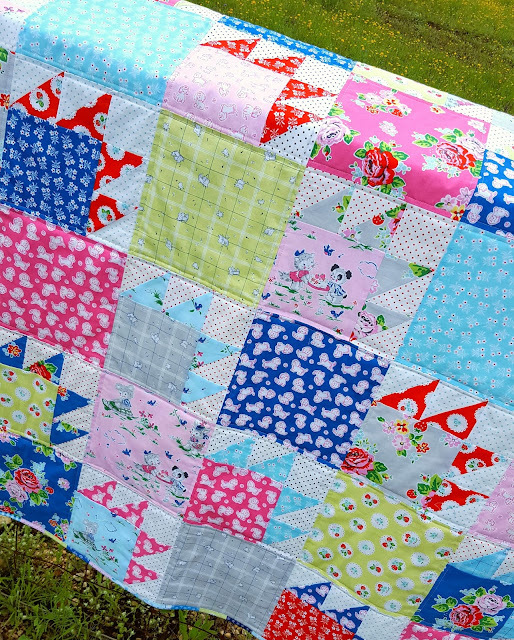 Oh this is the sweetest quilt!! I bet the girls couldn't wait to start using it. A darling photo of the girls, I love your Paw Print quilt, you were about the fabrics being perfect for this. Thanks for the link to rita saw a couple must haves and following her too. such a lovely pictures, Heidi .. I notice that you did basting on carpet floor the question is how to make it smooth like your final quilt? I did several time on my carpet floor since we have very limited wooden floor and messed up my quilt , its always move.. any tips ? Thank you so much! I've found that if I pin the four corners of my quilt to the carpet itself, I can baste a lot more accurately. I usually do better if I go downstairs to our wooden floor in the family room, but sometimes I'm in a hurry and take the shortcut! 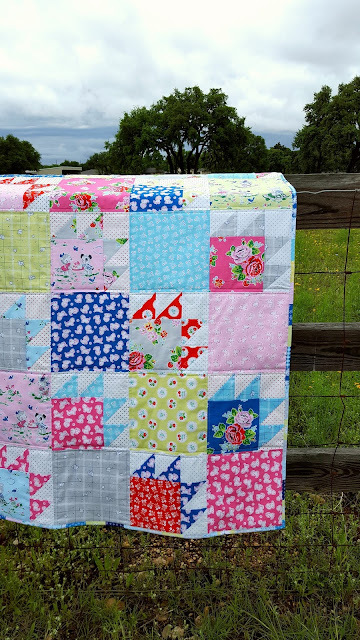 Such a pretty, happy quilt! Lovely as always, Heidi! Heidi!!! You have such a knack for making beautiful fabric even more beautiful!!! This quilt shines!!!! 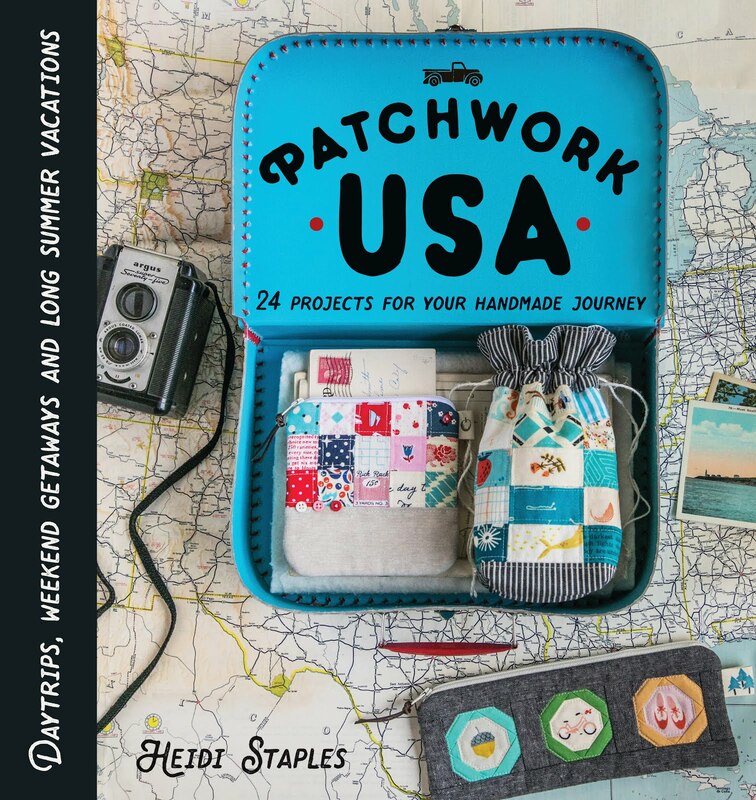 My post might have a little tea party inspiration too :) and I would have loved to use your quilt in my photo shoot! beautiful quilt: I love everything about it!! And I have that fabric in my shopping cart at Etsy. It is so adorable!! Hugs, H in Healdsburg. PS, where is the Texas hill country? 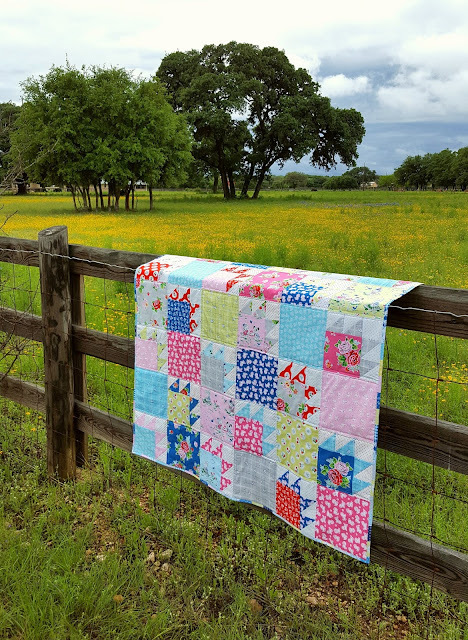 your first picture of the quilt with the meadow in the background is so beautiful!! Your little girls are soooo cute. 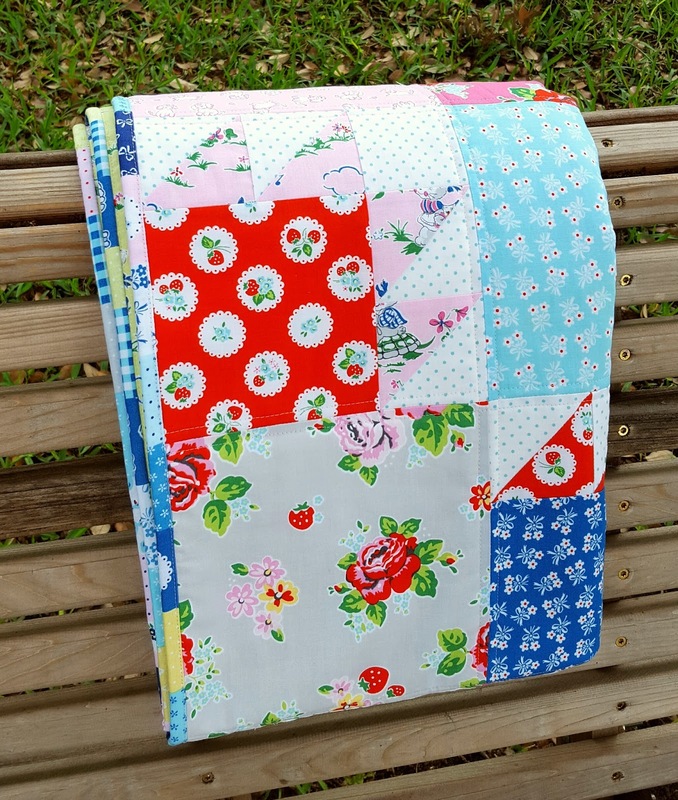 I love the photos you shared, also this fabric is just adorable. I can't wait to get my own. 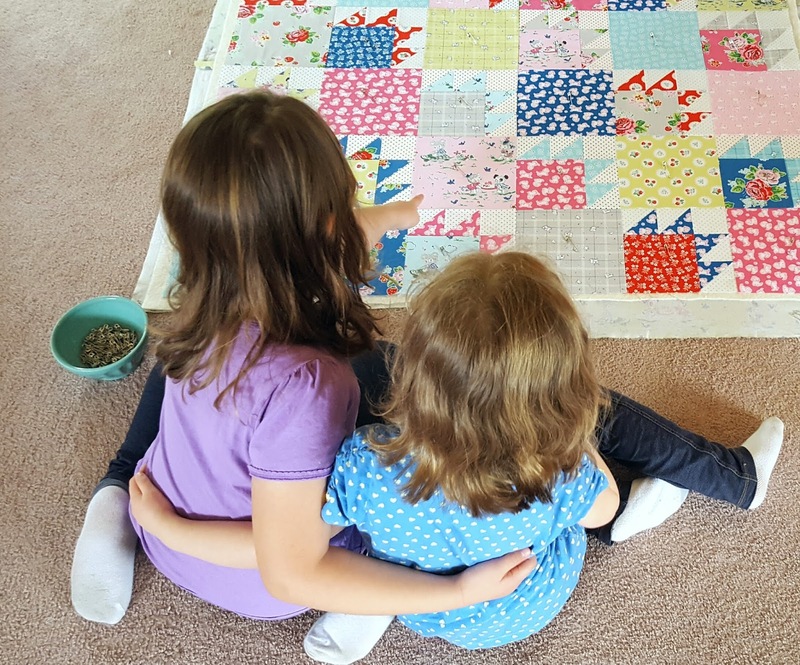 Beautiful quilt and great pic with your little ones. I lived in south Texas for four years and one of my fun things to do was to take. Drive through the Hill Country in Spring! Love all the bluebonnets! It's also fun to visit the antique stores that are there. I love the pic of your two girls! So sweet! Beautiful play quilt for your girls! I'd use it for my self hehehehe. Oh so cute!! !